Inside Sales has become a critical component of the sales and marketing strategy for all high tech companies. 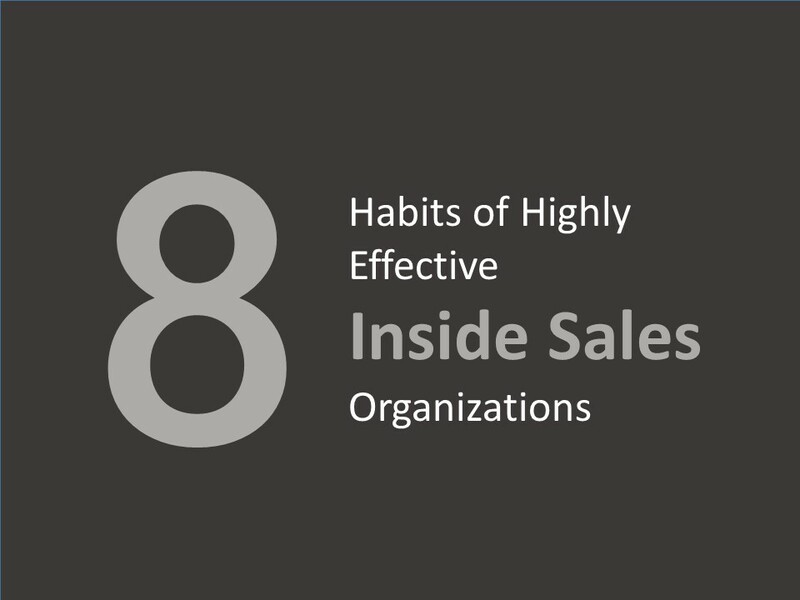 Many companies are using Inside Sales to generate leads for their field organizations. Others use Inside Sales to not only find deals, but also close smaller sized deals. But there is more to Inside Sales than hiring some lower paid reps and connecting a phone system. To get the most out of your Inside Sales organization requires optimizing every aspect of the operation – from recruiting to reporting. Below are eight strategies I have observed Highly Successful Inside Sales organizations utilizing. Highly Successful Inside Sales organizations carefully study their top performers to understand the behaviors and personalities that make an ideal candidate. For example, some companies might find that qualities such as ambition and curiosity are more important than product or technical knowledge. Adding these often overlooked soft skills to a candidate profile checklist can reduce the odds of making a bad hire. Increasingly, recruiters are using technology to identify the best talent from a larger pool of candidates. For example, inside sales candidates might be asked to participate in a mock phone call that is recorded and analyzed. New software algorithms can analyze speech patterns to identify the best phone etiquette and techniques. These type of algorithms can be useful for assessing language skills as well. Suppose you are an English speaker that needs to hire a rep with French or German language skills. Software can validate a candidate’s pronunciation and fluency to ensure they really speak the language. Additionally, Highly Successful Inside Sales teams view recruiting not as an HR task, but as a sales and marketing activity. Hiring managers write powerful job descriptions that attract the right kind of motivated candidates. Some even produce marketing collateral that explains career paths and fringe benefits of working at their company. Highly Successful Inside Sales organizations have strong new hire on-boarding and enablement programs. For example, first a new rep might attend formalized training sessions to learn sales skills (weeks 1-2). Next, they might attend classroom style training to understand the company’s products and value proposition (weeks 3-4). These might be followed with e-learning modules to build additional product knowledge (weeks 5-6). The e-learning might be accompanied by some basic outbound calling (think verifying/gathering contact details). After completing six weeks of formal training the new hire might shadow an experienced rep to observe calling strategies and objection handling techniques (weeks 7-8). Next the rep might transition into a full-time customer facing role. For example, they may be tasked with responding to inbound inquiries from your website or marketing programs for one month (weeks 9-12). With three months of training and simulation under the belt, the reps are ready to start outbound prospecting calls. The time cycles and the steps listed above might vary from organization to organization. 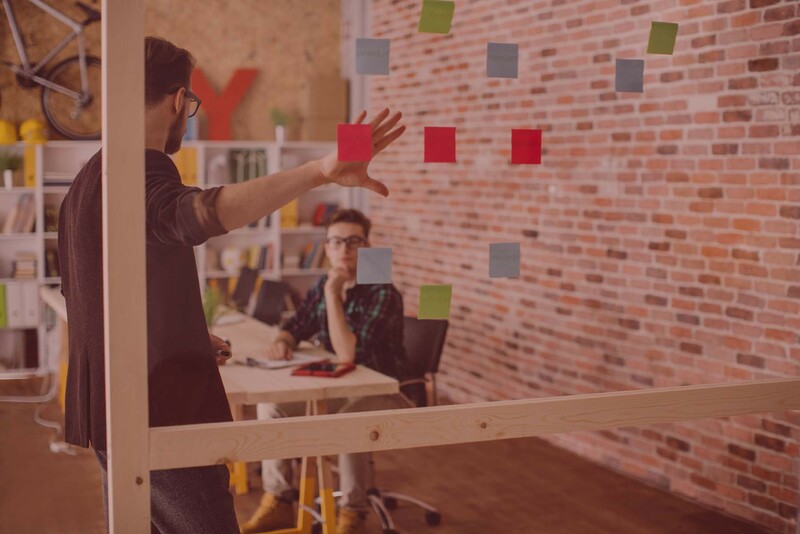 The most important thing is to have a methodical approach to on-boarding to optimize time to productivity. Perhaps, the most important aspect of the strategy is that learning should never stop. 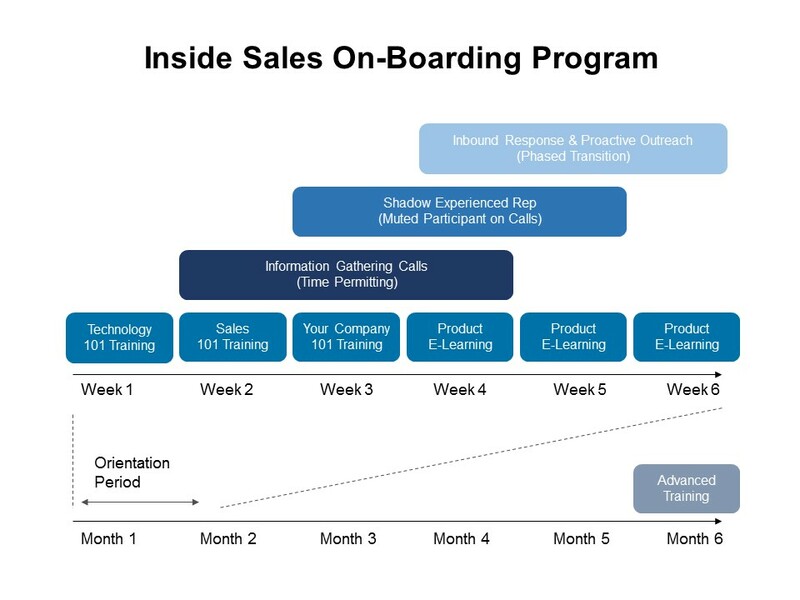 Beyond the three month on-boarding period there should continue to be educational programs on a weekly basis to build up sales skills and product knowledge. 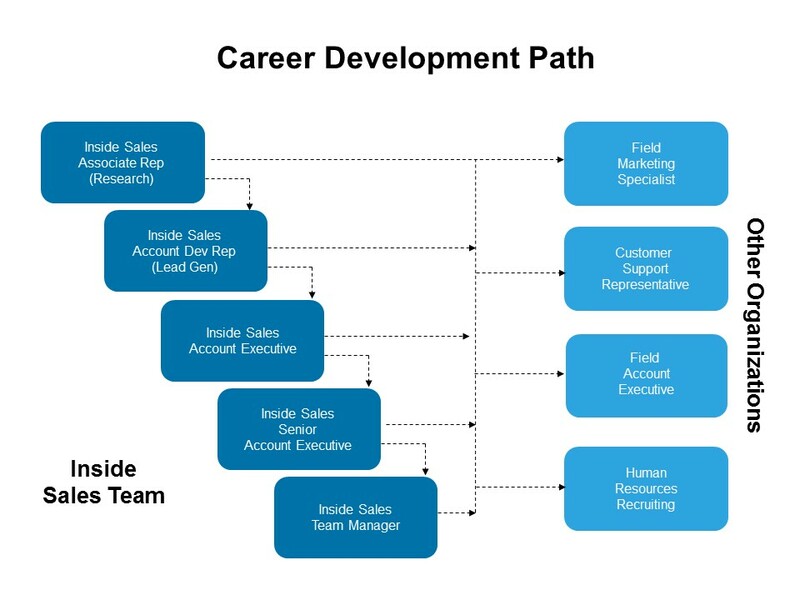 Highly Successful Inside Sales organizations have defined career paths for their employees. They understand that top performers are looking for upward progression in a short period time. As a result, they design their organizations with multiple tiers of roles. For example, junior reps with no sales experience might start out in a research gathering role for the first several months building up the contact database for the team. Other less experienced reps might start out in a demand generation role (Lead Development Representative) focused on qualifying opportunities for handover to a more seasoned account executive. Some companies may even have multiple tiers of Inside Sales account executives. Roles could be differentiated by the size of companies they can call on or the complexity of deals they work. After twelve months of strong performance as an “Account Executive” a rep might be promoted to “Senior Account Executive.” The best reps may be put on a management track. Others might transition into high-paying field account executive roles. Highly Successful Inside Sales teams acknowledge that they will not be able to retain all of their top performers. There simply are not enough slots to hold on to top talent due to the “up-or-out” nature of their model. In fact, some organizations track their alumni network on LinkedIn and use it as a marketing ploy during recruiting efforts. Our representatives either move up within the company or find external opportunities at companies like Oracle, Microsoft and SAP. Highly Successful Inside Sales organizations measure everything aspect of their operations and seek continuous improvement. They track the number of calls per day an Inside Sales Rep can make. They understand how the volume of calls varies based upon activity (outbound prospecting of cold contacts versus inbound qualification of warm leads). Ideally, Inside Sales acts like a factory. The inputs are raw contact data, leads and campaign strategies. The outputs are wins. Highly Successful Inside Sales organizations know the conversion metrics at each stage of the sales cycle. They know how many dials are required to get a conversation; how many conversations are required to generate an opportunity; how many opportunities are needed to get the desired number of wins. Conversion rates from discovery call to technical demo to price quote to contract signature are understood and updated regularly. Highly Successful Inside Sales Organizations also track many of the traditional sales metrics. Managers know what percentage of their reps are making quota. They know how many months on average it takes before a rep becomes productive. They know what the average deal size is.